A great all-rounder resort, Les Arc’s pistes are hugely varied so it’s a fantastic destination for a group of mixed abilities. Made up of 6 villages, each of them is worthy of a week's skiing alone: Arc 1600, Arc 1800, Arc 1950, Arc 2000, Peisey Vallandry and the lowest village Villaroger. Les Arcs is purpose built and is home to the ski evolutif method of teaching and has an Olympic speed skiing course. Also part of the Paradiski ski area with neighbouring resort La Plagne, Les Arcs is a resort for those who want extensive skiing but don’t want to pay Val d’Isere or Meribel prices in the Espace Killy and The Three Valleys. Linked by the double-decker Vanoise Express cable car, La Plagne is easily accessible in just a 4 minute journey via the lift! 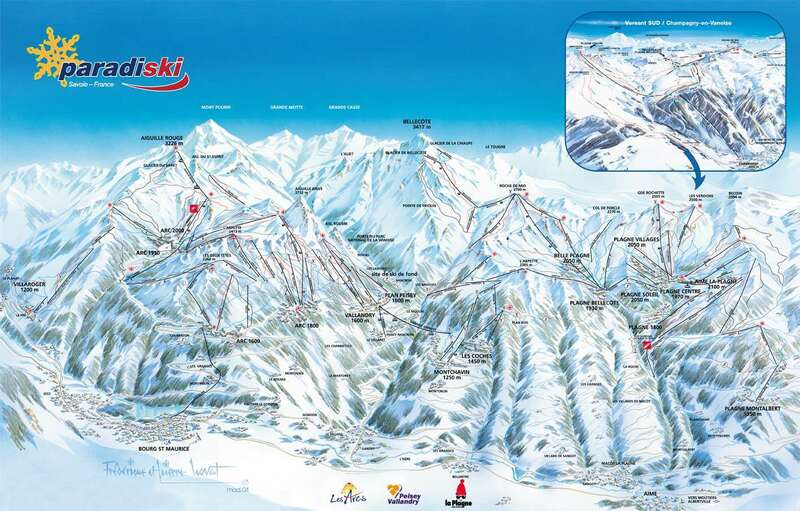 Beginners: Nursery slopes are conveniently situated above all three villages of Les Arcs. Arc 1800 is the best providing sunny and spacious runs. Easy greens are hard to find but there are some gentle blues like Mont Blanc above Arc 1600, and some snow sure easy runs down from Col de la Chal to Arc 2000 where there is flatter terrain. 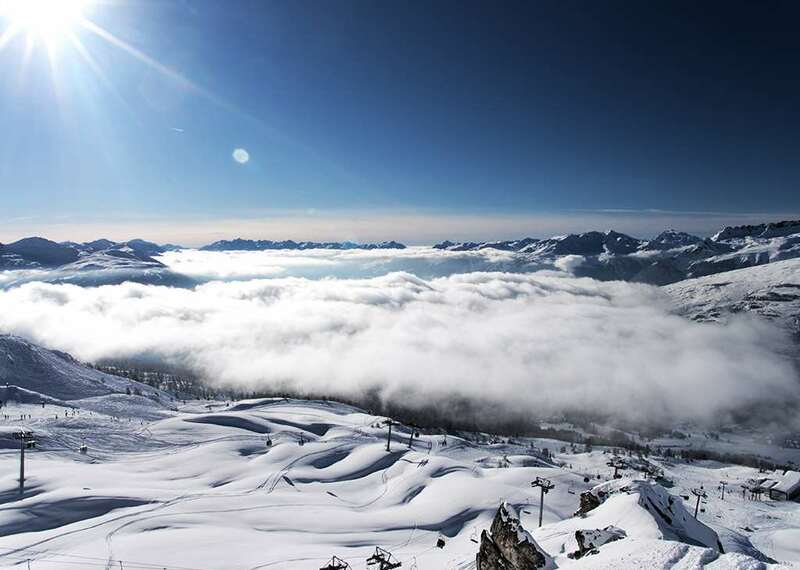 Intermediates: Les Arcs is the best for the choice of diverse runs for intermediate skiers. Most main routes have an easy and a more difficult alternative ideal for mixed-ability groups. Plenty of challenges for the adventurers and less confident intermediates will rejoice that they can move around the area without to many surprises. Les Arc Peisey Vallandry is great for speed hungry fans, while both ends of the full domain contain some great wooded runs. Experts: There is much to offer experts in Les Arcs. The Aiguille Rouge peak offers some excellent blacks with nice steeps located above Arc 2000. For some beautiful wooded runs head over to Les Arc Peisey Vallandry. One run stands out with its vertical drop of over 2000m where you can go from the top of the Arguille Rouge ridge down to the village of Arc Villaroger Le Pre. Off-piste opportunities for ski holidays in Les Arcs are numerous as is typical of great Alpine ski resorts. Snowboarders: Self-proclaimed 'home of the snowboard' Les Arcs holds an attraction for boarders. Les Arcs offers boarder friendly lifts, and for park rats a great snow park with half pipe. Snow is very reliable; with the majority of Les Arcs situated above 1600m and glacier skiing is possible at Arc 2000. Les Arcs also has snow making canons to ensure snow coverage during the early and late season. Les Arcs is a great resort for a family ski holiday as its slopes accommodate for all abilities. Les Arcs is great value for money and the ability to ski extensive terrain makes it ideal for a family to go and explore. Its purpose built ski in – ski out accommodation also make getting out onto the slopes and skiing back so simple and easy for families who are looking for a hassle-free holiday. A holiday in the mountains doesn’t have to be all about skiing. With non-skiing activities such as swimming, tobogganing, husky sledding, bowling and even having a day trip to nearby Bourg Saint Maurice means members of the family will be well occupied. In the resort centre and surrounding village, there are many bars, restaurants and clubs to enjoy. Some bars have live music from afternoon to late into the night whereas others have a more relaxed lounge bar vibe for quiet drinks by an open fire. Good recommendations are Hot Saloon and Chez BouBou. For après spots, L’Arpette by the snowpark is a great one to grab a demi peche and have a boogie. The DJ decks are in a bubble lift in the outside seating area! From luxury stops to great family spots, we have a huge range of fantastic Les Arcs apartments just waiting for your call. No matter what kind of ski holiday you're taking, we'll have just the accommodation you're looking for.